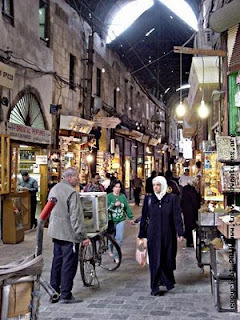 The Old City of Damascus is basically a huge bazaar, the center under a canopy like dome, dead by day, hopping at night. Walking around the area, one cannot help but feel a sense of antiquity, as if life might not have been all that different centuries ago. I guess it's a rare place where Caucasians (both sentient and insentient) are not the standard of beauty. 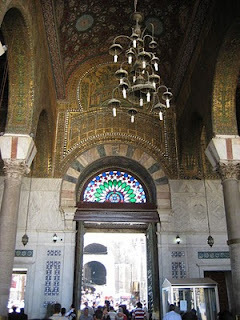 We arrive at the Grand Mosque of Damascus. It’s impossible to miss; in the Old City, all paths lead to this proverbial Rome. Originally constructed as a Christian Cathedral dedicated to John the Baptist, its origins are still reflected in the décor, a beautiful blend of Christian and Muslim sensibilities. To gain entry we rent robes to cover our bare legs, as most of us were wearing shorts. The courtyard is beautiful and spacious. Iranian Shiite Pilgrims line-up at the tomb of Husayn, grandson of the prophet Mohammed, all extremely eager to place their hands on this holy shrine. We stay there, admiring the beauty of the place, watching worshipers stream in and out of the Mosque for forty minutes, before resuming our exploration of the Old City. Amidst the crowded street, we happen upon a metal Israeli flag prominently displayed on the ground. In fairness to the Syrian people, other than some aggressive shopkeepers trying to sell their wares, tourists rarely get hassled. The exception would be if you try to avoid stepping on the Israeli flag. While I believe symbols only have the power people give them, I take issue with the energy behind the flag's placement, and the thought process of those choosing to step on it; both are hateful and divisive. Con—I really piss off about 10 million people. Pro-- I don't get shot. People often perceive disrespect towards chosen symbols in the same manner they might a direct physical assault, and react as such. That's the challenge with the limited identity most human beings ascribe to themselves. One act of hatred met in kind amplifies dissonance, making it easier to respond with violence, leading to war. The counterpoint of this is compassion which directly counters the waves of negativity. Hatred cannot long exist in the presence of love. I chose to walk around the flag; thankfully the bullet missed. We continued to the Christian Quarter, where we were promised Western style nightclubs which turned out in reality to deserted bars, albeit selling alcohol, a hard to find commodity in most Muslim countries. We purchased some beers, sipping on our cans atop mushroom shaped stools in a park, exchanging our travel stories, as we watched the ebb and flow of Syrian life carry on around us. We arrive back to hostel in the wee hours of the morning. as I silently ascend the stairs to my cot on the roof, my first incredibly busy twenty fours in Syria now complete. I lay down and quickly begin to dream of a world where hatred is met by compassion and love.